From the crust to the velvety whipped filling, this is 100% a No-Bake Cheesecake. The mascarpone cheese elevates the flavor and texture of the cheesecake. It is an elegant, crowd pleasing summer dessert. In the bowl of a food processor, coarsely break up graham crackers then pulse into fine crumbs. Transfer crumbs to bowl, add 1 Tbsp sugar and 8 Tbsp melted butter. Stir to evenly moisten crumbs then press into the bottom of a 9" springform pan going 1/2" up the sides. Freeze 15 minutes or refrigerate 30 minutes for crumbs to set. In a large mixing bowl, combine 8 oz cream cheese and 2/3 cup granulated sugar. Beat on medium/high speed 3 minutes until fluffy and smooth, scraping down the bowl as needed. Set aside. In a separate mixing bowl, using a clean electric hand mixer, beat 1 1/4 cups heavy whipping cream until stiff peaks form (3-5 minutes on high speed). Reduce speed to medium/low and beat in 12 oz mascarpone until well combined and smooth. Use a spatula to fold cream cheese into whipped mascarpone mixture until well blended. Fold in 2 Tbsp lemon juice, adding 1 Tbsp at a time and folding until well incorporated. Transfer cheesecake filling over the chilled crust and refrigerate at least 4 hours or overnight until completely chilled. Arrange sliced strawberries in rings over the top and brush the strained strawberry sauce over the top and serve extra strawberry sauce over each slice. 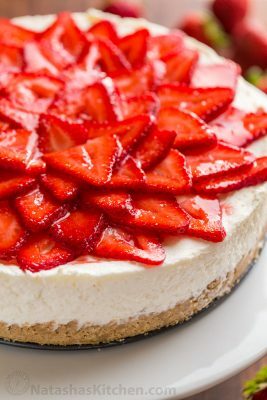 This no-bake cheesecake (the crust, filling and syrup) can be made up to 3 days ahead which is perfect for entertaining.